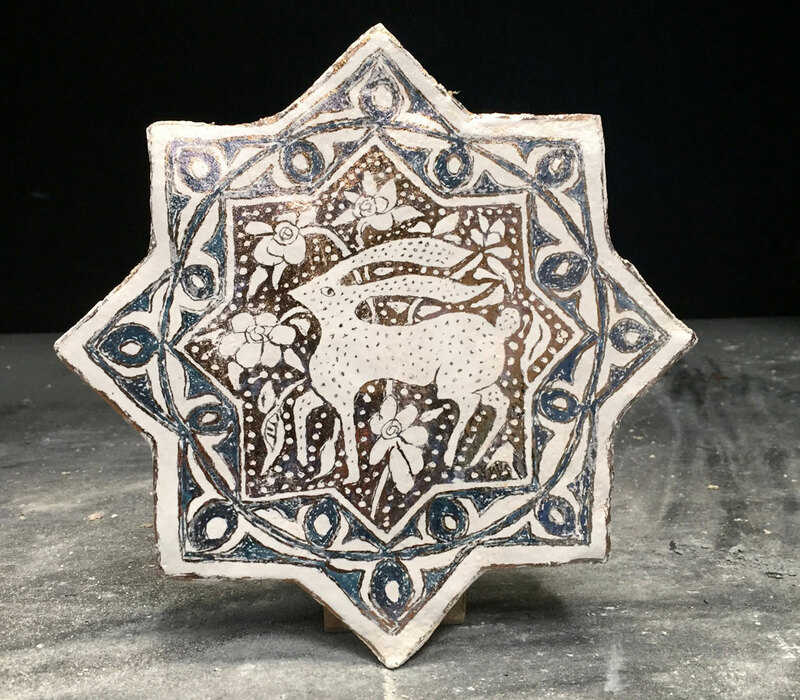 In this course led by Boris Aldridge, students will be introduced to 13th century Kashan tiles, (from Iran), considered by many to be the golden age of lustreware. Lustre-painted tiles developed as early as the 9th century and were used widely in Iran to decorate the facades and interiors of religious and secular buildings. With the Muslim injunction against the use of human imagery, star tiles with non-figurative decoration and borders of Qur’anic inscriptions for mosques, mausolea and madrasas. By contrast, tiles with human and animal figures and well-known verses from Persian literature adorned the interiors of secular buildings. Kashan was the principle centre for the production of fine pottery and tile-work in Iran. During the week, students will learn the techniques and motifs behind this exquisite form of pottery before designing and firing their very own lustreware tiles. This course is part of the Bagri Foundation Open Programme at The Prince’s School of Traditional Arts, which aims to expand the Asian arts courses at The School. Boris is a ceramicist with a special interest in architectural lustreware tiles. He has been making tiles for over 15 years from his workshop in Suffolk for both domestic and international clients. Over the last year he has undertaken extensive research into Kashan lustreware incorporating its distinctive motifs and techniques into his own practice.